we had an amazing view from our room, the staff was very tentative and nice! the hotel is older and is in need of remodel. The hotel is close to the beach so that’s a plus. It only has 4 elevators so there is a wait for one to pick you up and when it does arrive it gets full fast so you might be able waiting for quite some time. Awesome staff. Very friendly and professional. Our room on the 30th floor was updated and had an amazing view! Durig our staying,it's sM windy,so ourroom was very noisy.We wasn't able to sleep well. Terrific location. Property in good condition but slightly outdated, made up for by excellent staff. Beach, and restaurants were all walking distance. The hotel is in a great location. Walkable to Waikiki Beach as well as restaurants and shops, however we were somewhat disappointed with our stay. We booked accommodations for our family of 5 and by the time we got done with all the extra fees we paid at check in we were over $600 after complaining about and getting them down from $800. This was a huge price difference from our booking price because the room we booked only had beds for 4 people thus needing us to upgrade. There are over 30 floors in the building and only 4 elevators and only 2 I’m working condition. At times we waited 20 mins for an elevator. Overall this was an ok place to stay, but if you can afford to spend more than I would pass on this place. I would not stay there again. Will never stay here again or any Aston properties. Nothing worked, for example, cable in one of the rooms never got signal for the whole week that i was there, the Playstion 3 they had so you can play games and use as a dvd player never worked, and the cleaning people never really cleaned anything but make the beds and even that wasn’t a good job. Very noisy, the ceiling was cracked and looked like it was ready to come down. We really tried to spend the least amount of time in the room. First ever mother daughter's trip, they gave us an upgraded room for a few dollars more, 36th floor ocean view. We lost water in our shower for two days they gave us a discount for the inconvenience, room was clean, the view was awesome. Thank you Aston Waikiki Sunset, you made our trip special. This is the third time I have stayed here, and if I ever make it back will stay here again. Two bedroom Diamond head rooms are fantastic. No hot water for days! Hidden fees. Forced to pay for amenities not used or wanted. Sauna was down pool was smaller than expected. No view. Housekeeping was great. Location was good. This hotel was not very fancy but was great for my family. Walking distance from the beach and shopping center. Very economical with a kitchen. Especially since it come with plates and pots and pans. Love it. If I go back I would definitely stay here again. Early check in? Yeah right how about late check in? Room was 3pm check in. At 1 I asked if we could check in early, room not ready. But come by at 2 to ask. At 2, not ready. Okay... 3pm for sure.... so I came back. Not ready. Didn’t get into our room until 3:30. What a mess. Love the room, nice views, good stuff all around. Worst check in ever though. We are at the hotel after a nine hour flight at 9am. We requested an early check in and were refused. Check in was 3 pm. We arrived back at just before three tired and hot to be told the room wasn’t ready and when we questioned it were bluntly told check in was after three. Any other hotel would have made our room a priority knowing how long we had waited. Staff were blunt and to the point. No welcoming friendly faces. Hotel was a disappointment. When we later tried ringing reception as there was no bedding for the extra bed. When we went down to reception we were told she was busy so couldn’t answer the phone. No apologies! We went there on our honeymoon, we were welcomed by the faculty at the front desk as soon as we walked in. Be ready to have a credit or debit card on you because there will be a $200 deposit due. They won’t charge you up front, but can use that as your payment for ammenities at the end of your stay. The hallways do have a funny smell in them, but I think that is depending on what kind of neighbors you have, since there are kitchens in the rooms. The room itself didn’t smell though. Our room was very clean and there is a PlayStation in the room to rent movies or games if you have children. Every morning room service was prompt, and make sure to leave dirty towels on the floor or else they won’t take them. You do hear the wind a lot due to being in a tall building. There was no bugs or cockoroches in the room. There is a safe in the room for your belonging also. Overall we really enjoyed our stay and recommend staying here. Also off topic we recommend you to rent scooters if you plan to explore and go site seeing. That way parking will be free for you because you can park on the streets or the scooter place garage . Rather than paying $30 a day for a car parking at the hotel or $7.50. We rented them for 10 days and loved it ! Hope this helps you out and go get breakfast at the EGGS&THINGS ! Pancakes are bomb & pineapple juice and so is everything else we tried . 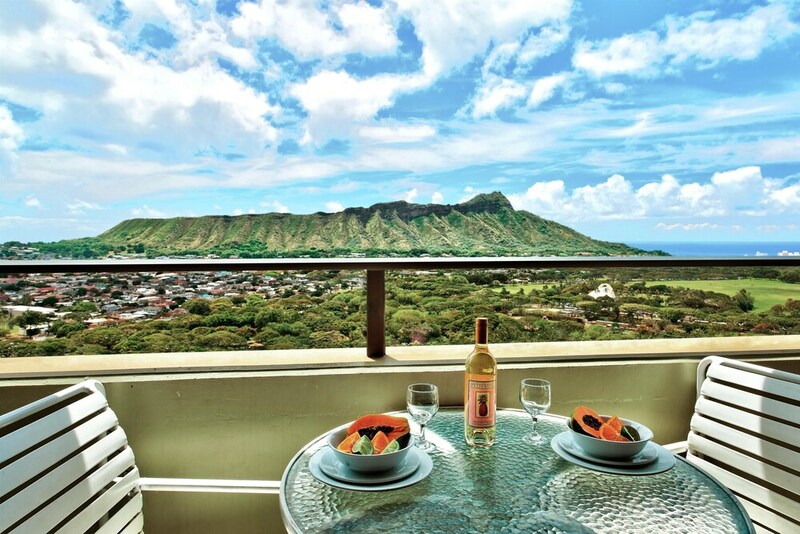 Located in Waikiki, Aston Waikiki Sunset is within a 5-minute walk of Honolulu Zoo and within 15 minutes of other popular attractions like Waikiki Beach. This 435-room, 3-star condo building has in-room conveniences like kitchens, lanais, and sofa beds. Each condo is air-conditioned and features a kitchen and a lanai, and there's space to spread out with a sitting area. Guests can expect to find WiFi and 32-inch an LCD TV with cable channels. The bathroom offers hair dryers and free toiletries. Other standard amenities include a sofa bed, a coffee maker, and a rice cooker. At Aston Waikiki Sunset, guests enjoy an outdoor pool, a fitness center, and WiFi in public areas. Self parking is offered for USD 25 per day. The front desk is staffed 24/7 to help with dry cleaning or laundry, and answer any questions about the accommodations. Additional amenities include conference space, laundry facilities, and a picnic area. Recreation features at Aston Waikiki Sunset include an outdoor pool and a fitness center.